Anemia is a nutritional deficiency caused by a lack of iron, folic acid, and vitamin B12, which leads to low red blood cell count and low blood oxygen levels. Symptoms include fatigue, headache, dizziness, cold hands and feet, chest pain, memory problems, low blood pressure, and hair loss, among many others. Anemia has many causes, including loss of blood (during menstruation in women), reduced level of erythropoietin (a hormone produced by kidneys), pregnancy, poor diet, and leukemia. Certain types of anemia, including hemolytic anemia, sickle anemia, and sideroblastic anemia, are caused not by nutritional deficiencies, but by malfunctions in the body. These types require professional treatment, so check with your doctor to find out which type you have before beginning a home treatment. 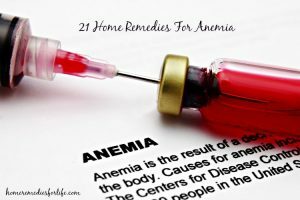 If you’re suffering from a simple nutritional deficiency, there are many ways you can treat your anemia at home, using safe, natural, affordable remedies. Ready to find out what they are? Let’s get started! Here are the effective natural remedies that increases the red blood cells count. Spinach is rich in fiber, calcium, iron, beta-carotene, and vitamins A, B9, E, and C. Boil ½ cup spinach in 1 cup water and add your favorite seasonings. This simple soup contains 3.2 mg of iron (which is 20% of the recommended daily amount for women). Be sure not to boil spinach for more than 3 minutes as the leaves will lose the oxalic acid that aids in iron absorption. Also try the two recipes listed below. Chop spinach, broccoli, watercress, kale, and celery. Mix with your favorite dressing and eat o increase the RBC count. Add 2 teaspoons of raw, organic honey to a glass of organic spinach juice. Drink once a day for at least 40 days to get rid of anemia. Blackstrap molasses is rich in iron, folate (a natural source of folic acid), and B vitamins, all of which help increase red blood cell count. Blackstrap molasses has a low glycemic index, so this treatment is good for diabetics. Mix 2 teaspoons of blackstrap molasses and 2 teaspoons of apple cider vinegar into 1 cup of water. Mix 1 tablespoon of blackstrap molasses into 1 cup of hot milk. It is also good for pregnant women and nursing mothers. Apples are rich in iron and beetroot contains folic acid, fiber, and potassium. Eat 2 apples and 2 beets a day. Beetroot peel contains the highest concentration of nutrients. Cook the beets in the oven and roast on the stove with peel. Now you can take off the peel and eat them with the peel. Mix 1 cup of organic apple juice with one cup of organic beet juice, and stir in 2 teaspoons of honey. Drink twice a day to increase hemoglobin levels in the blood. Parsley is rich in iron, folic acid, and vitamin C. Half cup fresh parsley contains about 5.5 mg of iron. It is rich in vitamin c, which helps the body to absorb iron very quickly. Use it in soups, stews, sandwiches, and salads, and try the tea recipe below. Put fresh or dried parsley in a cup. Pour in 2 cups of hot water. Strain, add 1 teaspoon of honey, and drink. Black sesame seeds contain lots of iron. Soak 1 teaspoon of sesame seeds in water for 3 hours. Grind soaked seeds to make a paste. Mix with 1 tablespoon of honey. You can also stir this paste into a cup of milk and drink it. Soak 2 dry dates in milk overnight. Eat the dates and drink the milk first thing in the morning on an empty stomach. If you don’t like soaked dates, eat them dried and follow them with a cup of milk. If you’re lactose intolerant, soak the dates in warm water for 3 hours instead of milk. Eat the dates and drink the water. Tomatoes are rich in lycopene and vitamin C, which helps the body to absorb iron and prevents anemia. Eat 2 fresh, raw tomatoes on sandwiches and in salads everyday. Or drink a glass of tomato juice daily. If you don’t like tomato juice, try mixing it with apple juice. Pomegranate contains proteins, fiber, carbohydrates, fats, and natural sugar as well as iron and calcium. It also contains magnesium, potassium, copper, and many essential vitamins. Drink organic pomegranate juice and eat pomegranate seeds daily, and try the recipes below. Add ¼ teaspoon of cinnamon and ½ teaspoon of honey to your pomegranate juice. Mix 2 teaspoons of pomegranate seed powder into a glass of milk. Bottle gourd contains iron and folic acid which increases the production of red blood cells in the blood. Chop 1 bottle gourd, ½ cup of beetroot, and 1 cup of spinach. Pour water in a pan and place on the stove over medium flame. Boil them in water for few minutes by covering with lid, or until the gourd pieces are soft. Season to taste, remove from heat and eat. Have this daily for a month to strengthen immune system. Raisins are an excellent source of sodium, calcium, potassium, fiber, iron, and protein. 100 gms of raisins contain about 1.88 mg of iron. Eat raisins daily, and if you’re not fond of the taste, try below remedy. Soak 10-15 raisins in ½ cup of water overnight. Next morning mix them with 1 teaspoon of raw honey, which is also rich in iron. Honey is a rich source of iron, copper, and manganese. It helps increase red blood cell count and the production of hemoglobin. Eat raw, organic honey on toast, pancakes, and waffles, mix it into your favorite herbal teas, use it in Asian or BBQ recipes, and try the recipe below. Mix 1 tablespoon each of honey, lemon juice, and apple cider vinegar. For those who do not eat meat, whole grains, nuts, and legumes—beans and lentils—are great sources of iron and folic acid. Be sure to eat a well-balanced diet and follow the tips below to ensure that your body absorbs the iron it needs from these sources. Eat kidney beans, lima beans, pinto beans, chickpeas, and green peas. Eat walnuts, almonds, and peanuts. 1/2 a cup of walnuts provides 3.75mg of iron. Eat fresh fruits and vegetables that contain vitamin C as these help the digestive system process iron. Avoid tea, coffee, and cocoa. Poly-phenols inhibit iron absorption. Fenugreek leaves and seeds are great sources of iron. They treat and prevent anemia by increasing red blood cell counts. Add Fenugreek leaves to soups and salads, and follow the recipe below. Add 2 teaspoons of fenugreek seeds and a pinch of salt to 1 cup rice and cook. Dried black currant has tons of iron and vitamin C, which aids in absorption of iron, increasing red blood cell count and hemoglobin. Soak 10-12 dried black currants in water overnight. Eat them before breakfast every morning. Bananas are high in iron and they stimulate the production of hemoglobin and other enzymes essential to red blood cell production. They are also a good source of magnesium which aids in hemoglobin synthesis. Eat fresh bananas daily, and sweeten them with 1 tablespoon of honey for a more enjoyable flavor. Eat 2 times a day. Beetroot contains a lot of iron as well as fiber, calcium, sulfur, and potassium. It helps increase blood oxygen levels and red blood cell count. Eat beets in salads and follow the recipe below. In a blender, mix 1 beet, ½ piece of cooked sweet potato, and 3 carrots until smooth. Blend 1 ripe banana with 1 tablespoon of Indian Gooseberry juice. Stir well and eat 3 times a day. Ash gourd, a.k.a. white gourd, winter melon, winter gourd, or wax gourd, contains iron, calcium, riboflavin, phosphorus, thiamine, vitamin C, and niacin. Peel 1 kg winter melon, remove its seeds, and chop it into 1-inch pieces. Poke little holes in each piece with a toothpick. Pour water in a bowl and boil for few minute. Now add gourd pieces, cover with lid and boil for 5 minutes but pieces should not be too soft. Drain water and add 3 ½ cups of sugar to pieces. After 30 minutes cook over low heat until sugar forms a syrup. Eat 2 pieces per day. You can store this for about a month to 45 days. Dry ash gourd fruit and leaves. Grind them into a powder. Mix 1 teaspoon of ash gourd powder into a glass of buttermilk. You can find this fruit easily in any Chinese stores or any health or ayurvedic stores. Yellow dock root helps the body absorb iron more efficiently. Mixing it with herbs rich in iron increases red blood cell count. Add all ingredients except molasses to a large soup pot. Bring to a boil, reduce heat, simmer 30-45 minutes. Cover while simmering so the liquid doesn’t reduce, but stir every few minutes. Remove from heat and add molasses. Add water and honey if it is too strong. Wheatgerm is a portion of the wheat kernel which is obtained by processed and refined flour. Wheatgerm contains iron, zinc, and other nutrients that treat anemia. This is beneficial for the vegetarian people. Drink 3 times a day to get rid of anemia. Dietary iron comes from two sources: animals and plants. The human body tends to absorb iron from fish, poultry, and meat more easily than iron from vegetables (about 15-35% more). Depending on what kind of liver you eat, it can provide 16-85% of the recommended daily amount of iron. Liver is also a rich source of vitamins B and B12, copper, zinc, and phosphorus. Try to eat local, organic, grass-fed meat that has not been treated with antibiotics or hormones. A balanced diet is essential to treating anemia. Follow the tips below to ensure that you get enough iron and that your body can absorb it properly. Eat iron-rich foods like liver, molasses, figs, whole grains, sea foods, almonds, beans, oysters, eggs, brown rice, grapes, poultry, yams and raisins. Eat potassium-rich foods like banana, few vegetables, dried fruits, whole grains, sunflower seeds, kiwi and broccoli. Eat foods rich in manganese, like whole grains, nuts, pineapple, legumes and eggs. Eat foods rich in vitamin C, like citrus fruits, tomatoes, and chives. Eat foods with folic acid, like mushrooms, lima beans, leafy greens, kidney beans and black eyed peas. Avoid caffeinated and carbonated drinks. Cook food in an iron pot to preserve nutrients. Mix about 60 ml of fresh alma juice with 25 ml of honey and drink it daily. Soak 5-7 almonds in water overnight, peel them in the morning and eat them before breakfast. Take cold baths a few times a week to increase blood circulation. Promote good circulation by getting full-body massages with natural oils like olive oil, mustard oil and coconut oil. Soak 3-4 figs in water overnight and eat them in the morning. Mix 5–7 black peppers in about 200ml of milk and boil them in an iron vessel for 5 minutes, then drink. Practice yoga, meditation, and deep breathing to reduce stress and increase circulation. The above remedies for anemia are natural and safe. If your anemia does not improve, consult a healthcare professional. Have you tried any of these methods? Let us know which ones worked best for you!